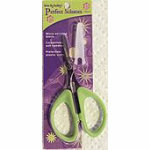 Tools > Karen Kay Buckley's Perfect Scissors Small 4"
Theme: Micro serrated blade keeps fabric from slipping so cutting is more accurate. Helps to prevent frayed,edges. Comfortable soft handles and protective plastic cover. Shipping end of November!